Product prices and availability are accurate as of 2019-04-23 09:57:40 UTC and are subject to change. Any price and availability information displayed on http://www.amazon.com/ at the time of purchase will apply to the purchase of this product. Survival has never been so easy. This knife features some of the best specs of any Z-Slayer knife out there. Let alone one specifically geared for survival. 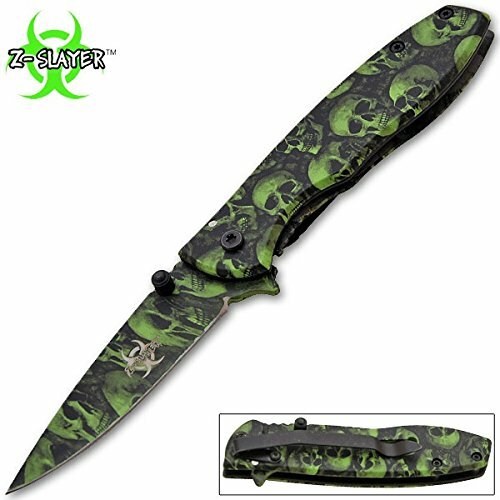 The Z-Slayer series never disappoints and this knife is no exception featuring the Z-Slayer logo etched on the blade. Undead skulls finish. Super sharp tactical blade. Drop point surgical steel blade Razor sharp blade edge - 2.75 inch blade. Pocket / belt clip built into handle - 3.75 inch handle. The ultimate pocket knife for survival - Lightweight knife only 3.7 ounces.